it seems that circumstances may be compelling me to start in a new scale sometime early next year - plarail. and here's the thing: if i knew then what i know now, about dollar per unit fun, i would have started with plarail from the very beginning instead of the100 n gauge sets i have. 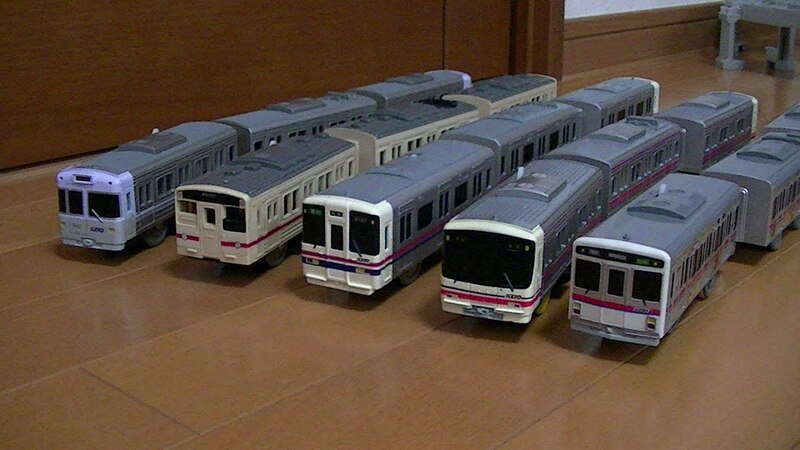 unfortunately the plarail keio 6000 (2nd from left) looks pretty terrible. the others look quite ok. Does this event include lots of drool? They are fun, I've often thought of getting a pile to have for the kids at shows,,but I'd probably end up playing plarail all day and ignoring the layout! I do have fun with my windup capsule trains, sort of mini plarail! potentially, yes, drool. but honestly we've not told any people we actually know personally, since, well, we're not young and it's best to give these things some time given all the possible pitfalls. you have one that is battery powered?! mine are tiny like 1" long and would have to be a coin cell or shorty 3v to fit and then not much room for a motor! mine are the ones you get in the 100Y vending machines. wow, best wishes and luck! I know that drill from quite a few friends. toys are a fantastic bennie! Hi Jeff, yes I have some battery powered capsule plarail. When they have a release of models they usually have one set which is powered so that makes for more of a challenge to get a powered unit or loco from the vending machines. 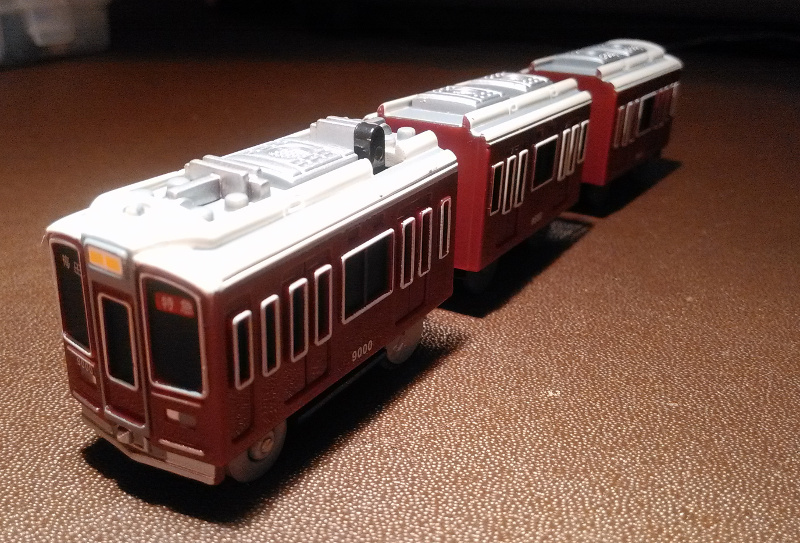 Here is a photograph of my Hankyu 9000 series and also an EF66. Plarail is amazing! Really! Cheaper, large range of trains, and an option to go Plarail Advance for more details without having to change tracks or whatsoever! The famous column circular layout. Are we there yet? Lastly a Plarail Advance Shinkansen video. Love the dog in the last one! Today, my son, my wife and I visited a mall where they had a small corner for kids to play with Plarail trains. My wife actually never has seen one up close and got pretty excited by them. "Oh, they are bigger than Brio and lighter!" So, quickly it was decided that my son also should have one. After lunch we got to TamTam across the street, where papa was allowed to buy an Odakyu 50000 type VSE. They are actually for 3 years and up, but we will only let him play with it with close supervision. It will be the first of many. I think this is a good excuse to start collecting Odakyu trains. I don't want to waste money on them in N-gauge, but Plarail is a great alternative for this. I thought I was the only one who'd bought a small handful of these! I have three Ef66s (one with a couple of container wagons), the Cassiopeia with the EF81, and a random Taki 43000 in green/grey. Oh, and some underground station parts. Uh HO, now the wife is bit! More fun for toni! Of course we know that supervision means toni playing trains! Ours comes out of storage once per week. Some that returned with us from Japan have been destroyed in normal young boy fashion. Others live on. And here is a NEW Plarail toy! Remember we heard about a transforming E5 Hayabusa toy? It has now been released on Plarail portal! Really interesting! Watch the video to see the transformation. Very good idea to use the coupling process as a good way to transform, and a lot of 'spring-open' mechanism were also included. An E6 is also in the works and will be able to not only couple together with the E5 but transform together also to form a larger robot! How to make a submarine from your Plarail trains! Wow! Batteries must loose current quickly, but I guess if low electrolytes then would work for a bit. Looks like a one shot thing. Fun when you are bored with running plarail the regular ways! Wonder if there are videos of trying to jump them or good plarail crashes?! For those who missed out on the Kato one and fancy a change of scale. Somehow I think I will survive without either. Stupid question. This is Japan. I have seen a lot of Lego train crashes I've done a lot of them my self too. but wooden gauge and Tomy gauge are about the same I used to run Tomy on my wooden railways back then. besides has any one just went on Yahoo Auctions ordered a huge lot of usedTakara Tomy and what ever comes is what came? what key word should I use in yahoo auction for that? "ジャンク" and "まとめ" are useful search terms. I have no clue what that says because I cant read Japanese but I assume its what I am looking for. 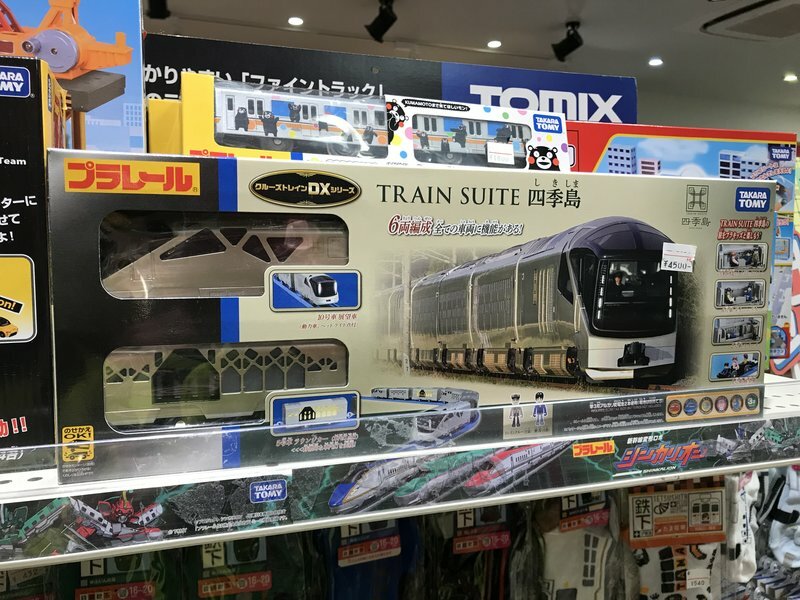 I found nothing pla rail related, The search terms must be really broad because so much other stuff comes up and it takes a while to scroll through page after page until I find a TOMY lot. Can you just send me a link to a Tomy specific search. Thanks. "プラレール" is the Japanese term for "Plarail", the others mean "junk" (which would be better translated as "not in mint condition") and "job lot". The top page for Plarail stuff is here. Lol, great squid, only in japan would there be a mascot catching the flying train! Thanks! That is awesome. Can't show my son. 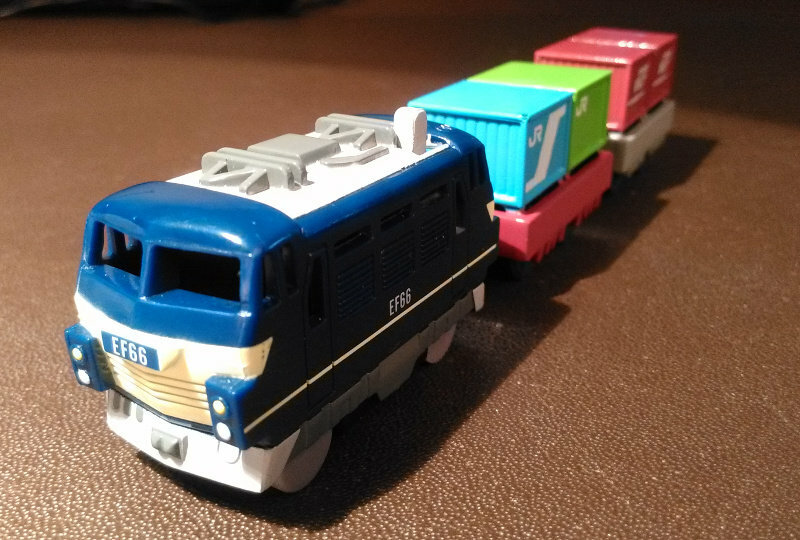 We got our first Plarail set (A 500 set) when my son was like 8 months old, on our first trip to Japan. Between Thomas and the Japanese engines, he accumulated many many many many sets and he still looks at them and picks a few up sometimes when we are there (he just turned 15). The one he wanted this last time was not available stand alone, only in a large set, so he skipped it and bought KATO trains. My daughter, to be different, started getting the Plarail Advanced stuff a few trips ago and has a few sets, but this last time we did not see any, so it appears to have not taken off enough for Tomy Takara to continue?